Demand for shoes punched for City head nails brought forth the SX Series. The SX-8 is a 5/16″ thick shoe with graduated widths. 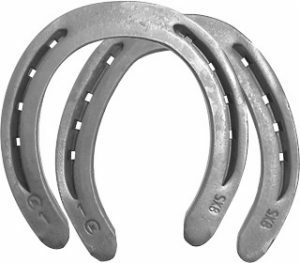 These shoes are used for trail, jumping, dressage and ranch work. Shoes are symmetrical. Sole relief now available on fronts. Kerckhaert SX-8 Clipped have a strong clip from top to bottom; quarter clip fronts, side clips behind. Because the clip is not drawn from the web of the shoe, the integrity of the nail holes and shoe strength is protected. Toe area is slightly wider to provide strength and wear. Front shoes have sole relief. Shoes are symmetrical.